ECU Remap vs Diesel Tuning Box – Which is better? Most people (except maybe diesel tuning box manufacturers!) will agree that a diesel tuning box is no match for a proper engine remap. And how could it be? – To map a n engine properly, in accordance with engine speed (rpm) and load, it is essential to know what the engine speed and load values actually are at any given moment. A full engine remap performed by a reputable remap specialist will always be able to out-perform any diesel tuning box in terms of performance, economy and drive-ability. HOW A TUNING BOX WORKS? Tuning boxes work in a different way – essentially overruling the ECU and tricking it into increasing engine performance. Fitted between the engine sensors and the actuator, a tuning box sits down the line from the ECU, and alters the data that the ECU receives and sends to the engine. This means feeding the ECU inaccurate data about fuel pressure and telling the ECU that the fuel pressure is lower than it is – so the ECU forces the engine to increase the fuel pressure to compensate, boosting engine performance. However, this can be dangerous, and there’s always the chance that you overstress the engine, causing unnecessary wear and tear and reducing the lifespan of your engine. ECU remapping is taking a read from the ECU’s processing chip of the vehicles standard compromised map and adjusting various parameters within the map such as fuel pressure, boost pressure (on turbocharged applications) ignition advance and throttle pedal control amongst others to release the true performance from the engine. It is a completely safe process as it is just giving the engine the performance it should have had in the first place before all the compromises were applied to the original programming. Every engine will have its own unique map and by adjusting this we can fine tune the characteristics of the engine; unleashing more power and in many cases reduce fuel consumption too. An ECU re-flash or remap works by altering the software inside the ECU – a vehicle’s on board computer that’s responsible for controlling vital engine functions including ignition timing, fuelling and boost pressure. Feeding the ECU inaccurate data about fuel pressure and telling the ECU that the fuel pressure is lower than it is!! The Quantum Remapper (touch screen tool) is an amazing device to reprogram your vehicle ECU within few minutes through vehicle’s OBD port. The most advanced & reputed tuning box can alter only the fuel pressure and fuel duration by tricking ECU which can be harmful to the vehicle’s engine in the long term. Torque reduction when shifting gear (for comfort and durability) is retained The on board trip computer shows improved fuel consumption, but the real amount left in the tank is less, as fuel is being injected without any of the sensors detecting the additional amount entering the cylinder. 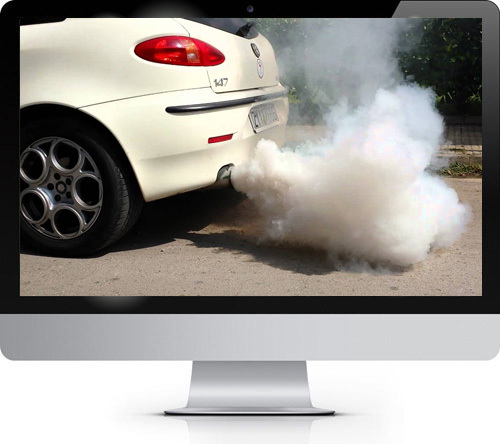 Regeneration (emptying) of diesel particle filter (DPF) is retained optimal Short term solution with cheap rates with an already programmed chip which feeds the ECU inaccurate data about fuel pressure & end up getting nothing. Correct calculation of exhaust temperature & service intervals Tuning Boxes can be installed in minutes and updated through the post minimizing down time. A quality remap from Remapper can alter various functions of ECU to get you the best performance your vehicle need, not just the fuel pressure and fuel duration. Well, there are few reputable diesel tuning boxes to name, Even some of the more reputable diesel tuning box manufacturers have been known to get a little ‘creative’ with their fuel economy and performance claims, but few would be foolish enough to claim they can compete with a professional fuel remap. So what’s best? Tuning box or Remap? 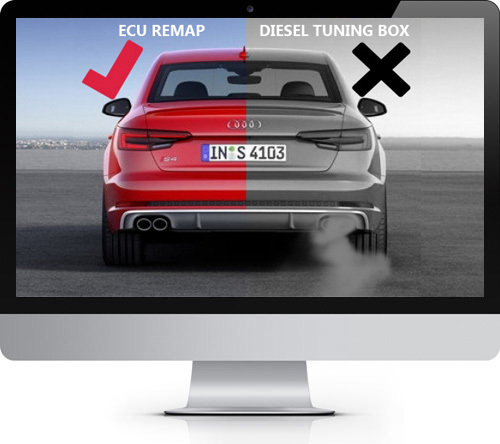 The main factor in choosing a remap over a tuning box is that every company’s software is different and it is essential that it is developed properly to ensure good power comes with maintained longevity of engine components. A remap isn’t just a remap… it’s the end result of one person’s individual knowledge! It’s important to remember that not all ECU remapping services work in the same way, and choosing the right kind of remap will make a huge difference. Many remapping firms will simply upload a generic remap and send you on your way – but this will not provide you with the best results. It’s much better to go for a high quality remap that’s fully customized to your vehicle. At Quantum Tuning, we connect every vehicle to our chassis dyno to test performance as part of the remap, so we can tailor it to meet the idiosyncrasies of your vehicle.